Painting a grim picture of Gujarat’s rural areas, the latest Socio-Economic and Caste Census (SECC), released on Friday, says that a staggering 94.81 per cent of rural households reported their maximum income below Rs 10,000 per month. Significantly, this is against the all-India average of 91.71 per cent, and worse than all 21 major states with the sole exception of Telangana (95.32 per cent) and Andhra Pradesh (96.8 per cent). The poor state of incomes of the highest earning member of Gujarat’s rural households comes amidst Government of India seeking to project Gujarat as a “model” state, where agricultural incomes have allegedly risen sharpest in the country. In fact, for nearly a decade, under Narendra Modi’s chief minisership, the state government kept talking about “double digit” rate of agricultural growth, despite expert view that the calculation was based on taking a poor monsoon year as the base year. Pro-Modi economists such as Prof Bibek Deboy even tried to make out that the rural poverty in Gujarat has come down much faster than most other Indian states. He is reported to have said that the “real story” of development of Gujarat is in the rural areas. The SECC was conducted during 2011-12, with some states completing the data collection in 2013, due to a lengthy process of seeking objections on collected data. 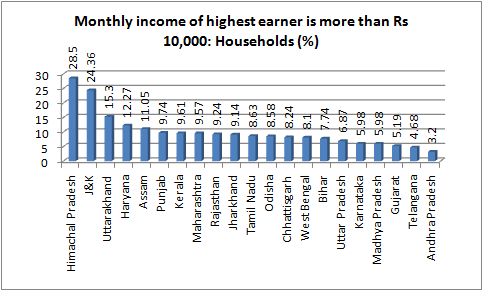 What is shocking for Gujarat is, the percentage rural households reporting highest earning member with incomes between Rs 5,000 and Rs 10,000, is also one of the lowest in India – just 11.5 per cent households as against the all-India average of 17.18 per cent. 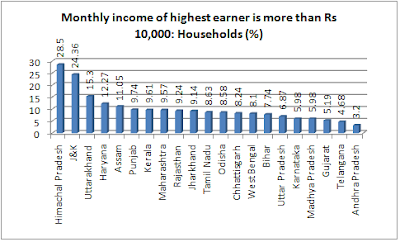 Of the 21 major states, just one state, Telangana, reported that its households had still lower number of highest earning member with income between Rs 5,000 and Rs 10,000 (7.33 per cent). 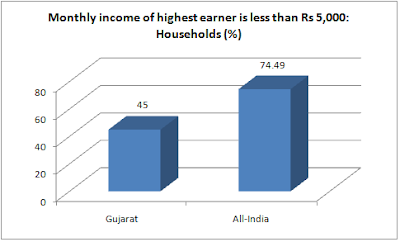 However, ironically, if the SECC data are to be believed, there is a far fewer proportion of rural households in Gujarat with the highest earning member earning less than Rs 5,000 (45 per cent). 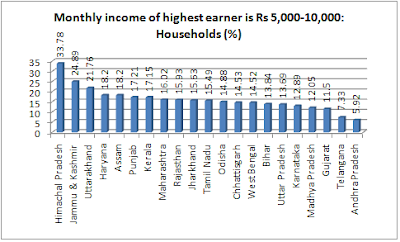 This is against the all-India average of 74.49 per cent, with only two states, Andhra Pradesh and Telangana reporting lesser proportion of households with incomes less than Rs 5,000 – 29.26 per cent and 40.02 per cent, respectively. The all-India average is 74.49 per cent. 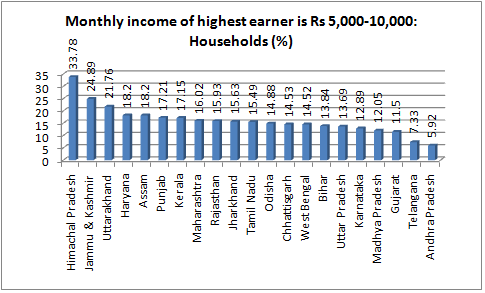 There is, however, little explanation in the SECC data, released by high-profile team consisting of Union finance minister Arun Jaitley, minister for rural development Birender Singh and chief economic adviser Arvind Subramanian, about the rural households which do not fall in the three categories of rural household incomes whose data have been released – household heads having income less than Rs 5,000, between Rs 5,000 and Rs 10,000, and more than Rs 10,000. The SECC data show further that Gujarat has the least percentage of rural households living in rural areas (59.52 per cent) compared to other states with the sole exception of Tamil Nadu (57.53 per cent). Gujarat’s rural illiteracy is 31.01 per cent illiteracy (national average 35.73 per cent). Six states have a lesser proportion of illiterates – Kerala 11.38 per cent, Himachal Pradesh 22.05 per cent, Uttarakhand 25.41 per cent, Tamil Nadu 26.38 per cent, and Maharashtra 26.96 per cent. The SECC data also show that for 41.09 per cent of Gujarat’s rural households cultivation is the main source of income, as against the all-India average of 30.1 per cent. Then, there are 43.28 Gujarat’s rural households which depend on manual labour as the main source of household income, as against the all-India average of 54.14 per cent. Gujarat’s just 1.29 per cent rural households depend on domestic work as the main source of income (all India average 2.5 per cent); 2.49 per cent depend on own non-agricultural enterprises (all-India average 1.61 per cent); and 11.38 per cent depend on “other” rural activities (all-India average 14.01 per cent). While there is no explanation of what “other” could be, an analysis of the data from all the states suggests one of the major sources of income could be fisheries. Yes, I also think so that there is something wrong with the income data. But the link that you have provided does not provide income factor at all.